Cream cheese crumb bars the next best thing to cream cheesecakes. 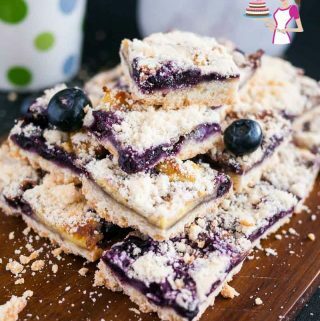 This simple, easy and effortless recipe for blueberry cream cheese crumb bars with a buttery crust on the bottom, creamy blueberry, and cream cheese filling in the center topped with a crisp crumb baked to perfection. Use fresh blueberries when in season or frozen during the year. I can never have enough berries when they are in season. 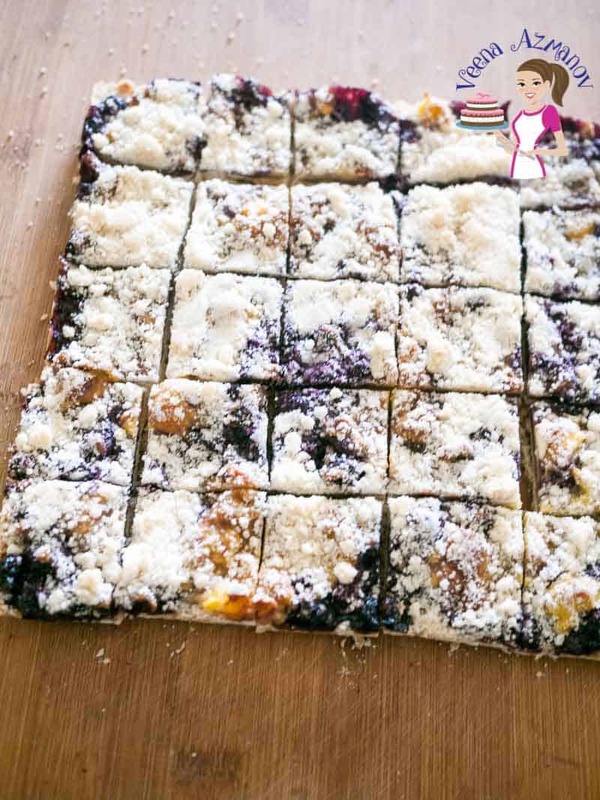 We love eating them just as is but I have a way of adding them to my ice creams, smoothies, tarts, cheesecakes, these delicious squares, and bars. I mean there is so much you can do. Unfortunately, the berry season is always so short so I even freeze them for the rest of the year so I have to rely on less buying and using more of what I have frozen when they were fresh. Do you remember my apricot crumble Squares/bars? these are very similar. Those are without cream cheese of course. Very popular and something you must try in summer when apricots are in season. These are a much lighter version of cream cheese bars. But do not mistake them to be similar to cream cheese desserts. They are not loaded with cream cheese. Here I wanted to keep the fresh blueberries are the main ingredient not drown them with too much cream cheese. The cream cheese just adds a nice creamy texture but still keeps that tart element you get from the berry at the same time nestling it between a rich buttery crust and melt in the mouth crisp top. I think you will love it. Unfortunately, berries have a very short season so often we have to rely on frozen or canned blueberries. Both work great! Today I am using fresh blueberries in season. Fresh – just wash them clean. remove any stalks and discard any that look bad. 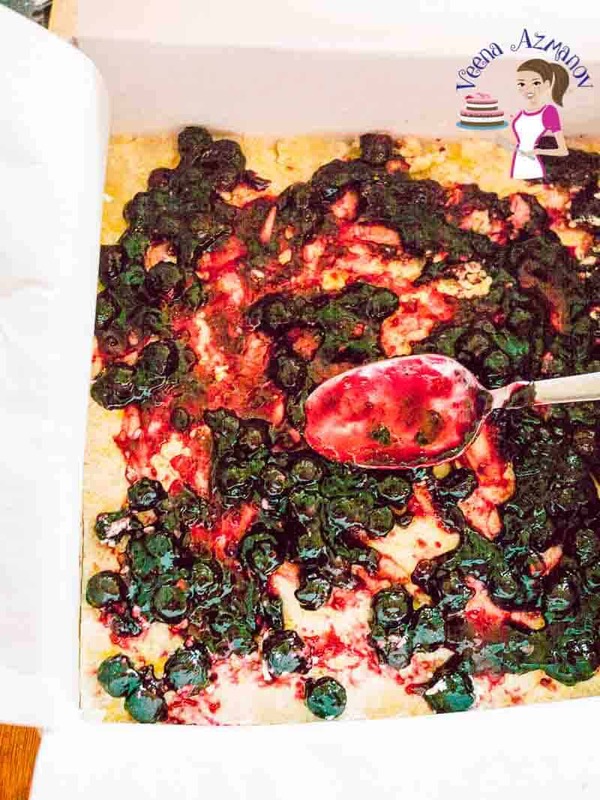 Canned – Drain well, reduce sugar as suggested below and use only the amount of liquid as required in the recipe below. Frozen – Thaw, drain any excess liquid then use as suggested in the recipe. Blueberries – If using frozen you can keep the amount of sugar but if use sweet canned blueberries then I suggest reduce the sugar by half. Best practice is to taste and see how sweet they are. If you not sure half the sugar would work great as a guide. Spice mix – There is so much flavor you can add to this and yet a simple vanilla on its own works great which is usually my preferred in summer. keeps it fresh. In winter I often use a pinch of nutmeg but Cinnamon is another spice that does great here too! If using frozen or canned blueberries – drain them well. Pulse a few times – until breadcrumb consistency. 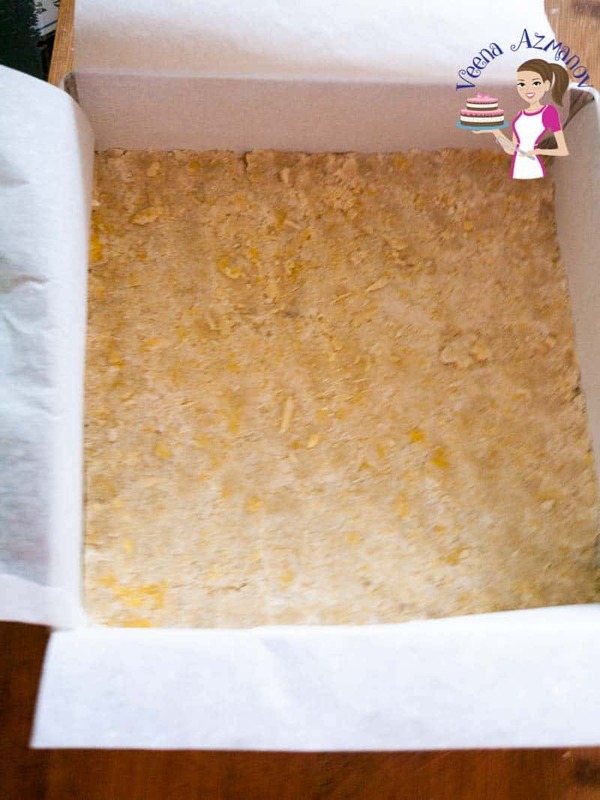 Save 1/2 cup crumble for the crumb top and use the remaining for the base. Keep the bowl of crumble topping chilled in the fridge. To the rest – add the 2 tbsp of milk – mix well. Tip – Do not prepare the filling too early. The juices will make the base too wet and soggy. Add sugar, lemon, vanilla, salt, and cornflour to the blueberries. Mix well. Spread cream cheese on the slightly cooled crust. Pour the blueberry mixture over the cream cheese mixture and spread evenly. 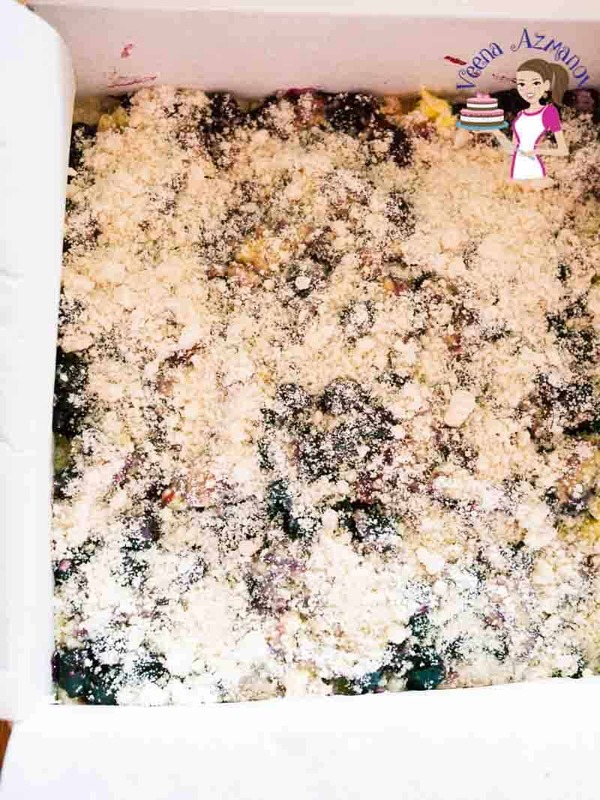 Remove crumb topping from the fridge. Continue to bake in the oven for another 35 to 40 minutes until lightly golden. If using frozen or canned blueberries - drain them well. Pulse a few times - until breadcrumb consistency. To the rest - add the 2 tbsp of milk - mix well. Tip - Do not prepare the filling too early. The juices will make the base too wet and soggy. 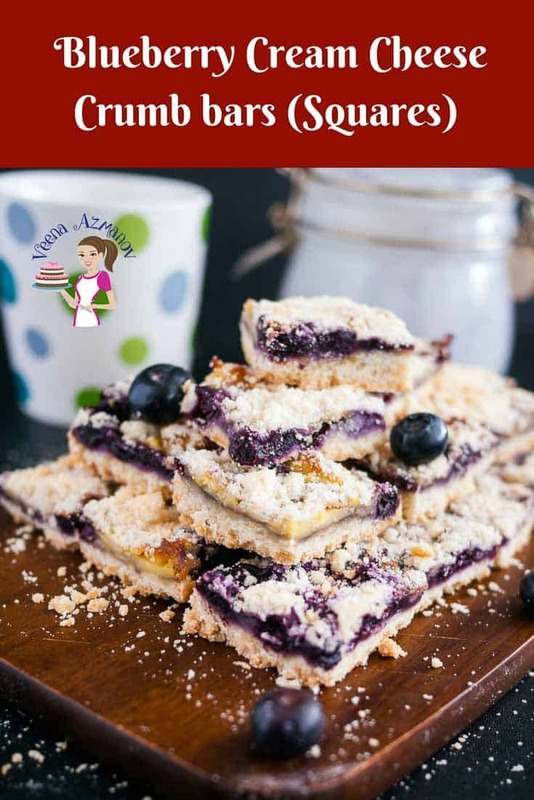 My most popular blueberry filling that works a treat in cakes, tarts, desserts, and toppings for ice creams. Or make a No churn blueberry ice cream. 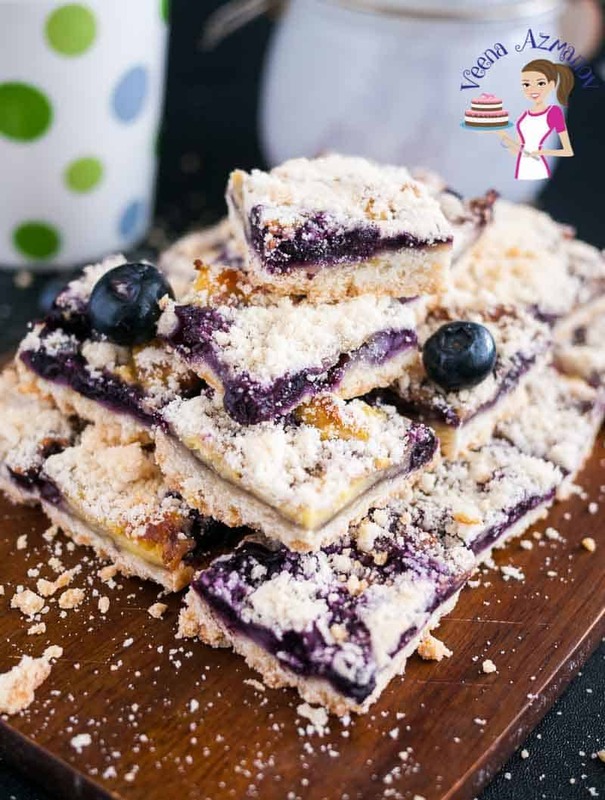 Try a blueberry cream cake for an even tea. There is my blueberry banana chia smoothie that makes a great start to breakfast or brunch. Entertain with indulgent blueberry desserts like a classic blueberry tart, blueberry cheesecakes or mini blueberry cream cheese tart. Apple Blueberry cupcakes work a treat when kids are around too. I LOVE LOVE LOVE blueberries! That sounds so flavorful! One of my favs. I can’t WAIT to try this! Thank you for this great recipe! So YUMMY! Thanks, Dan. I hope you try it. Thank you, Heather. So beautiful. 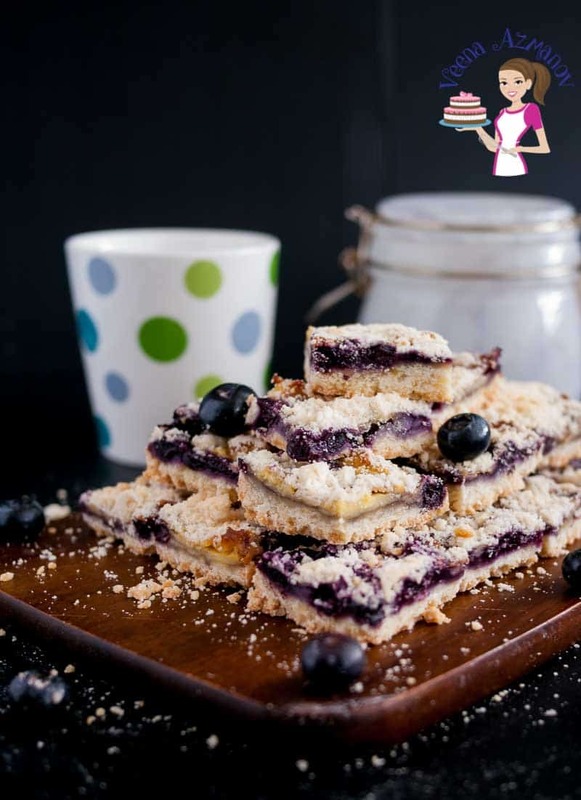 I love blueberries and I am always looking for different ways to do them. These look easy and I was looking for something to whip up for my co-workers and I can see we’ll be enjoying these this week. Thank you, Tina. I hear you. I love simple and easy and I bet your friends will be enjoying these. 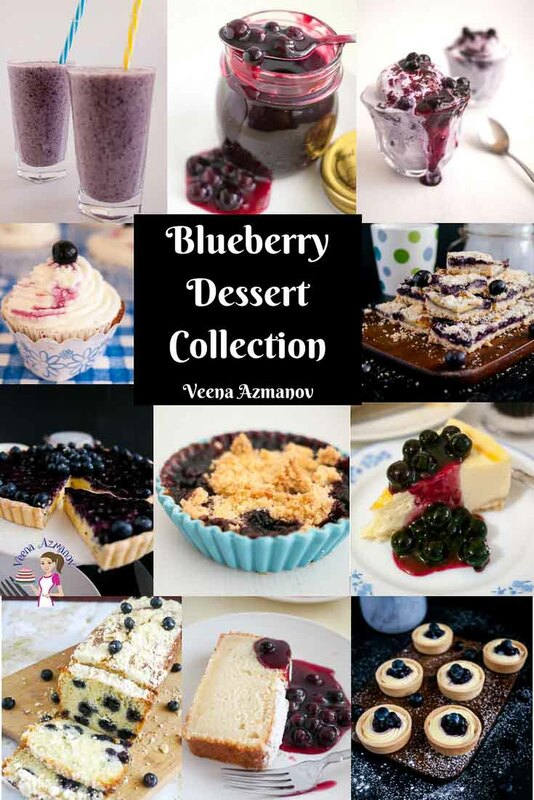 I am trying to make as many desserts with blueberries as possible while they are in season! 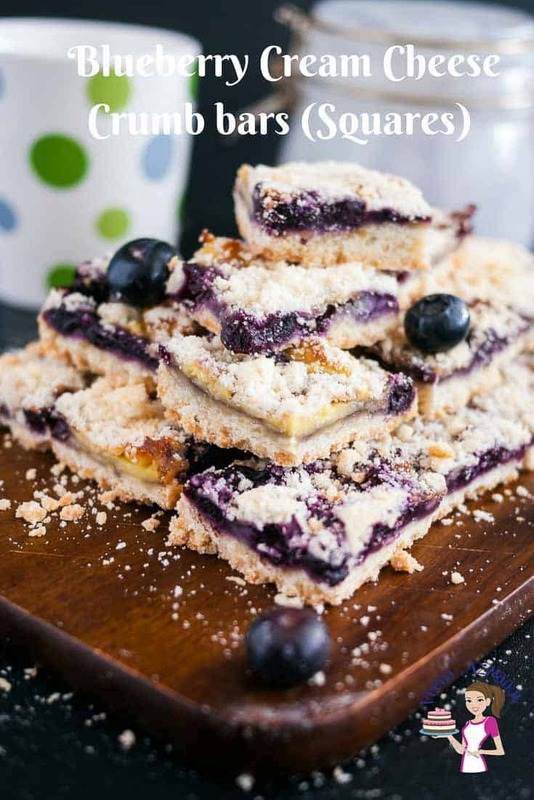 Great to find one more idea- your cream cheese crumb bars look fabulous! Me too Ruchi. I love blueberries so I even freeze them when possible. 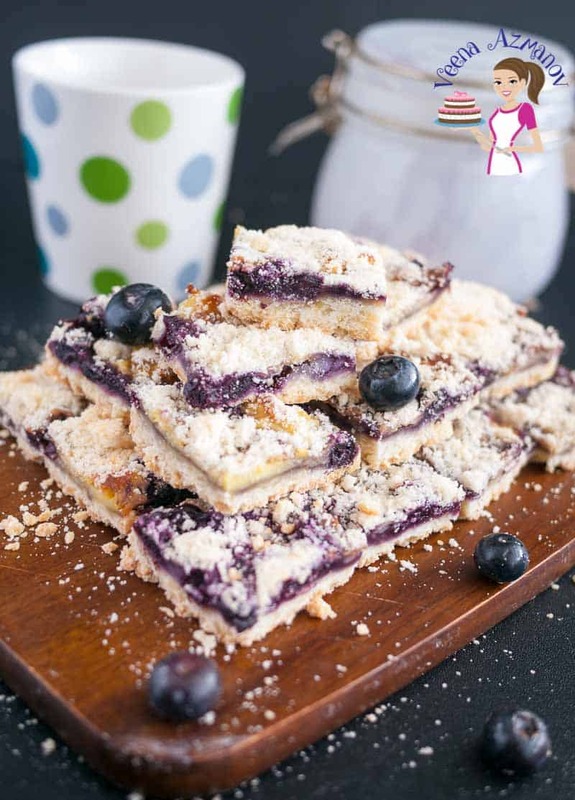 I love this blueberry cream cheese crumb bars, perfect creamy cheesecake and crumbs, I just posted a crumb cake this one is going to be my next recipe. Thank you, Swathi. I saw the crumb cake you posted this morning too. Looked so delicious I added it to my list of future must try treats. Oh these look amazing! 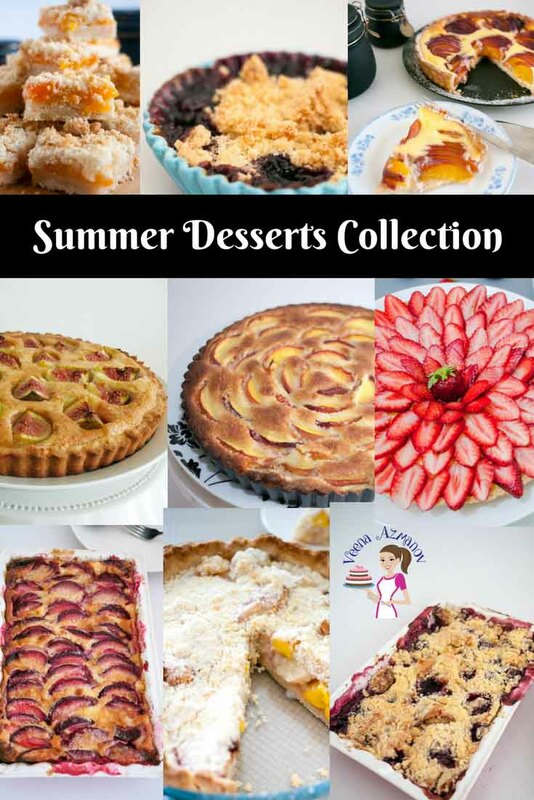 And I’m currently a big fan of recipes that most might enjoy as dessert, for breakfast! YUM! Thanks, Lauren. These would be perfect both for breakfast as well as dessert. Thank you Tammy. Yeah these are so good. Not too heavy on the cream cheese either. They were gone so quick. I hope you try them. It was absolute heaven Padmajha. I hope you try make it. Nice work!! This is a very well thought out and structured post. 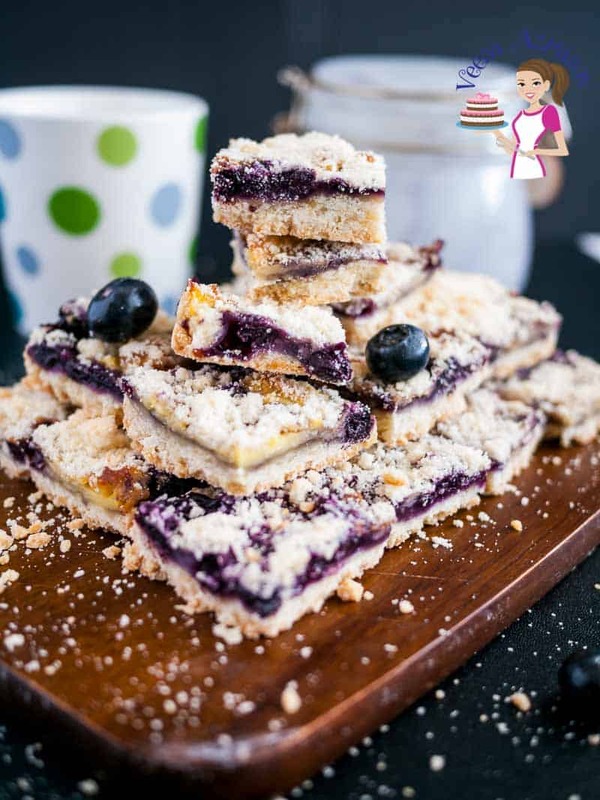 I love the layers is these crumble bars. Thank you so much, Nicolas. Happy you like my writing style. I love crumb bars and crumb buns, the more crumbs there are the better. These sound quite tasty!